In 1812 America declared war on the British. They saw the British as too focused on France to fight in America and thought they would win easily. They were wrong. The Battle of New Orleans took place in February 1815, at the end of this war. 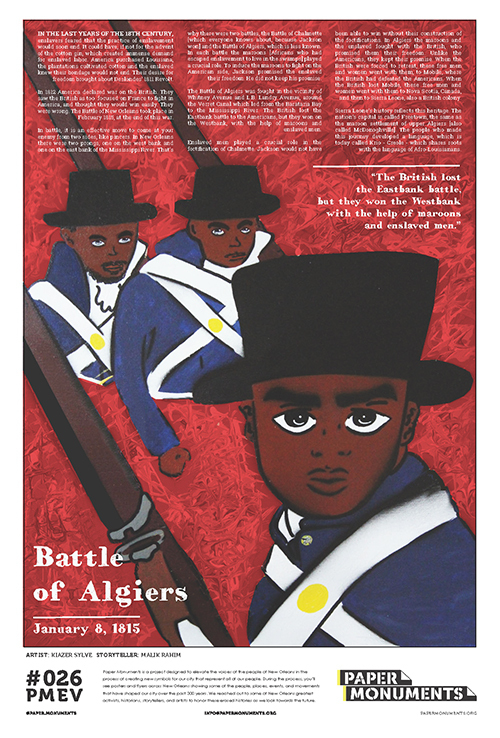 Paper Monuments, Kiazer Sylve, Artist, and Malik Rahim, Storyteller, “Battle of Algiers,” New Orleans Historical, accessed April 24, 2019, https://neworleanshistorical.org/items/show/1454.